Caring For The American Ebola Patients: Inside Emory's Isolation Unit : Goats and Soda The "patient biocontainment unit" at Emory University Hospital is one of four facilities in the U.S. specially equipped to handle the most serious infectious diseases. The two American Ebola patients are being cared for separately in rooms like this in the special isolation unit, known officially as the Serious Communicable Disease Unit, at Emory University Hospital. When it comes to deadly, contagious disease outbreaks like Ebola, the terms "quarantine" and "isolation" take on fresh relevance and urgency. Each has a distinct meaning in the public health context, though the words are often used interchangeably and both refer to protecting the public from communicable illnesses. Relying on quarantine is a centuries-old strategy to separate the healthy from the sick in hopes of containing infectious disease. The first known formal quarantines went into effect in 14th century Europe to stop the spread of plague, known as Black Death. (The word "quarantine" itself is derived from the Italian quaranta, 40, referring to the number of days the ill were kept apart from everyone else). In 18th- and 19th-century America, quarantines were imposed during outbreaks of yellow fever and cholera. The U.S. Centers for Disease Control and Prevention (CDC) now maintains 20 quarantine stations in the United States, which can detain and examine people — and animals — believed to be carrying dangerous infectious diseases. A quarantine goes into effect when people have been exposed to an infectious disease but "may or may not become ill," according to the CDC. Since it's not yet known whether they are infected, they're separated from the general population to prevent possible spread of the disease. Pandemic influenza, SARS, cholera, diphtheria, tuberculosis, plague, smallpox, yellow fever and viral hemorrhagic fevers (such as Ebola) are all subject to quarantine in the United States. Isolation of patients, a more extreme step, can be imposed when people have already fallen ill. In the U.S., this generally means that patients are confined to medical facilities, visits by others are severely restricted, and medical personnel are required to wear protective gear. 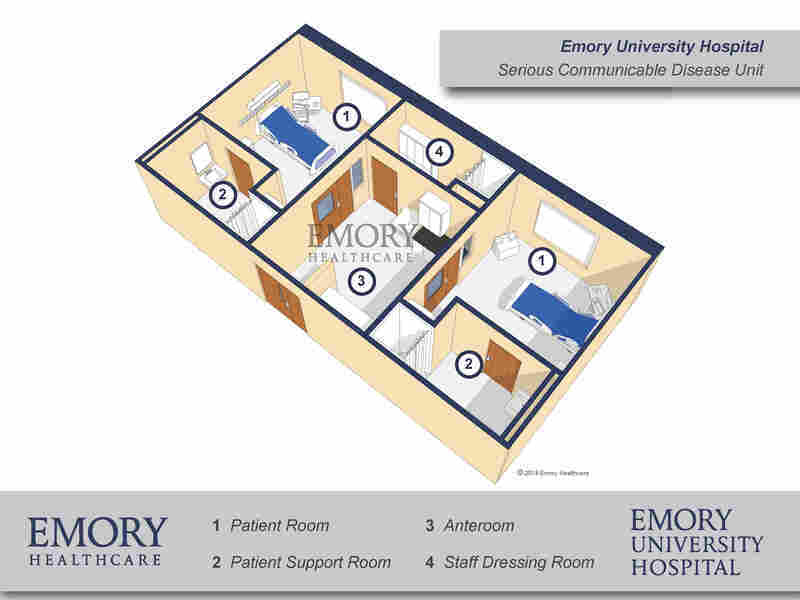 Negative air pressure at Emory University Hospital's Serious Communicable Disease Unit ensures that air moves only from the hallway to the anteroom to the patient room and not in the opposite direction. While useful in preventing the spread of airborne infectious diseases, it is not a crucial feature for limiting Ebola, which is not airborne. How is this unit different from an ordinary U.S. medical isolation facility — what is the equipment and infrastructure that makes it unique? The four Patient Biocontainment Units in the United States have a combination of factors to control the spread of infectious pathogens that are not found together in any other units around the country. The air pressure is negative so that air flows from the hallway to the anteroom to the patient room. 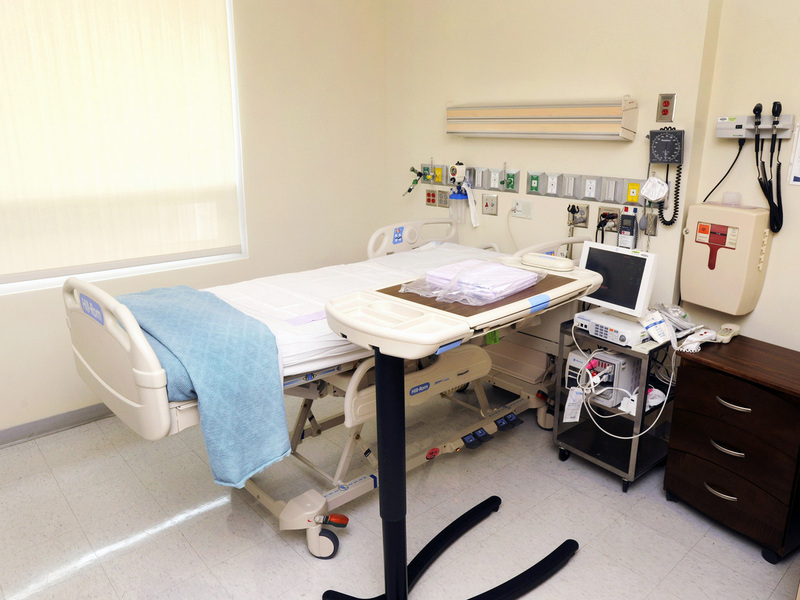 The room is designed as an ICU so that patients with any degree of illness can be safely cared for. The rooms have large anterooms and a biosafety cabinet for specimen processing. The rooms have 20 air changes per hour so that all infectious particles are rapidly removed. Air flow is laminar in nature, which means it flows from the supply vent to the return with little potential for mixing. Air is HEPA [high efficiency particulate air] filtered before being exhausted. What is the significance of a negative air pressure system for medical isolation — in other words, why is the special air filtration so important? Negative air pressure means that air moves from the hallway to the anteroom to the patient room, and not in the reverse direction. Since Ebola virus is not spread through the air, this feature is not important for the treatment of patients with Ebola virus infection. However, for diseases that are spread via the air, negative air pressure ensures that air carrying infectious particles does not spread to the hallway or other parts of the hospital, thus preventing spread of infection to visitors, patients or health care workers. What exactly must medical staff wear when they enter the facility? Does it take a long time to gear up? We care for the patients using personal protective equipment designed to prevent our staff from coming into contact with blood, body fluids and large respiratory droplets. If the patients are having lots of diarrhea or vomiting we use Tyvek suits. Otherwise we use standard gowns and gloves. We use masks and either face shields or goggles to prevent exposure to respiratory droplets. We have never timed the putting on or taking off of personal protective equipment, but it doesn't take that long. How are these and any medical equipment disposed of or sanitized after medical staff leave the unit? All disposables are autoclaved [sanitized via pressurized steam] and then incinerated. Equipment that is not disposable is disinfected according to the manufacturer's directions. Your unit includes windows through which patients can see family members and other visitors with whom they can't have physical contact while they're ill. What kind of windows are these? [They] are standard glass windows sealed in the normal fashion. How are doors in the unit sealed? The doors don't need to be sealed because all airflow goes into the patient room since the rooms are under negative pressure. How is food for the patients delivered into and taken out of the facility? Food is carried in on disposable trays. All remains are autoclaved and incinerated. How exactly is waste disposed of? We disinfect it to kill any viruses and then flush the material down the toilet. How do patients bathe and use toilets in the facility — are there special accommodations for these needs? Patients shower as normal. Waste is handled as [previously described]. Is the unit intended for any serious disease? The unit is designed to care for patients infected with any pathogen. All of its features are not required to care for a patient infected with the Ebola virus — but it is a convenient location to care for such a patient.